If you haven't yet heard, Babe Ruth / Cal-Ripken along with just about every other major youth recreational baseball league governing body (Little League, Dixie, Pony, etc.) has adopted a new baseball bat standard for 2018 and beyond. This new standard was created by USA Baseball so bats will perform more like traditional wood bats and the testing/certification across manufacturer's will be more uniform. This will have a significant impact on our recreational league divisions of Rookie and above as just about every bat used in previous seasons will now be illegal. The MIYBL Board of Directors will determine before the 2018 season starts, ramifications/repercussions for players and/or managers caught using illegal bats. Unfortunately there has been some confusion based on the name of the USSSA organization which created the old standard and the USA Baseball governing body's new logo which identifies bats approved for use going forward. Bottom line, any bat used for MIYBL recreational league play MUST have the new USA Baseball logo depicted on it below for legal use in our league. Bats that have the old USSSA Coefficient of Restitution Certification (BPF Logo) are no longer approved for Recreational League Play at MIYBL. The only exception for very few MIYBL players are those that participate in our Spring AAU Travel Program. AAU (Ametuer Athletic Union) is one of the very few organizations that did not adopt the new USA Baseball bat standard for 2018. MIYBL players that have old USSSA certified bats can still use them only for AAU activities in 2018. For more information on bats rated for tee ball, see this document. 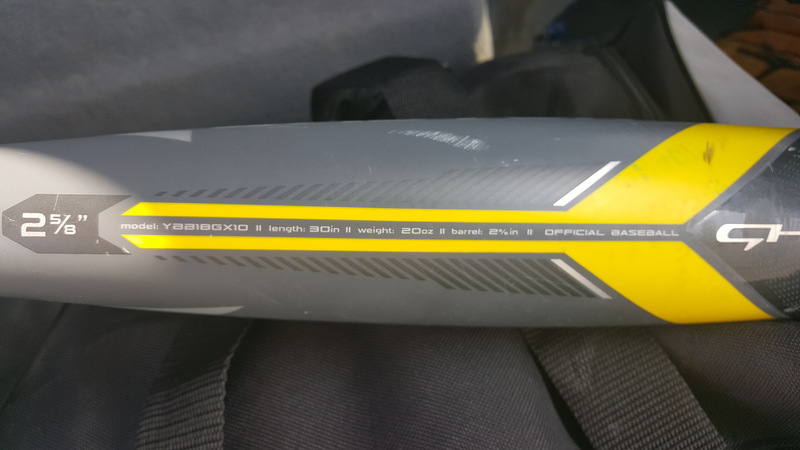 Easton regrets to inform you that the Easton Ghost X, 30” -10 USA Baseball bat (model #’s YBB18GX10 30/20 & LL18GHX 30/20 Japan model) is no longer certified or approved by USA Baseball. Easton acknowledges full responsibility for this situation, and we seek to resolve this issue as quickly as possible. If you purchased one of these bats, you can return it to us. We will provide you a mailing label that you can use to return your bat to us, at our cost. Upon receiving your bat, we will send you a $500 electronic voucher that you may use on easton.com. You may use this voucher to purchase another bat, or any other Easton products available at easton.com, with free shipping. Once we receive your information, we will send you a return shipping label within 36 hours to send the bat to Easton. Upon receipt of your bat, we will send you a $500 electronic voucher redeemable for any product on Easton.com. Please understand that is a decertification of the 30” size only, and that there are no structural problems or other defects with this bat. All other certified lengths & drop weights of the Easton Ghost X USA bat remain approved for play.